Springfield, Ohio Looks To STEM School To Lift Economy, But Will Its Grads Stay? What can a city in decline do to make a comeback? In Springfield, Ohio, a new school is trying to turn the tide. But local leaders say keeping young people from moving away is key to economic revival. 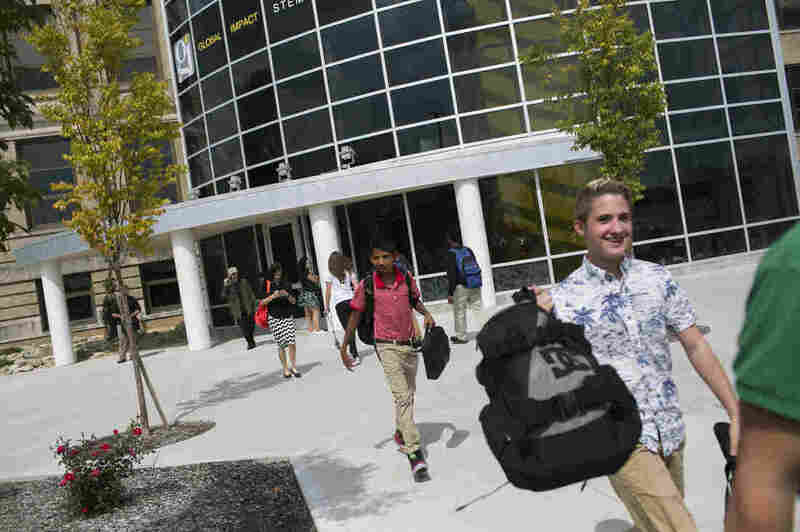 A City Looks To STEM School To Lift Economy, But Will Grads Stay? 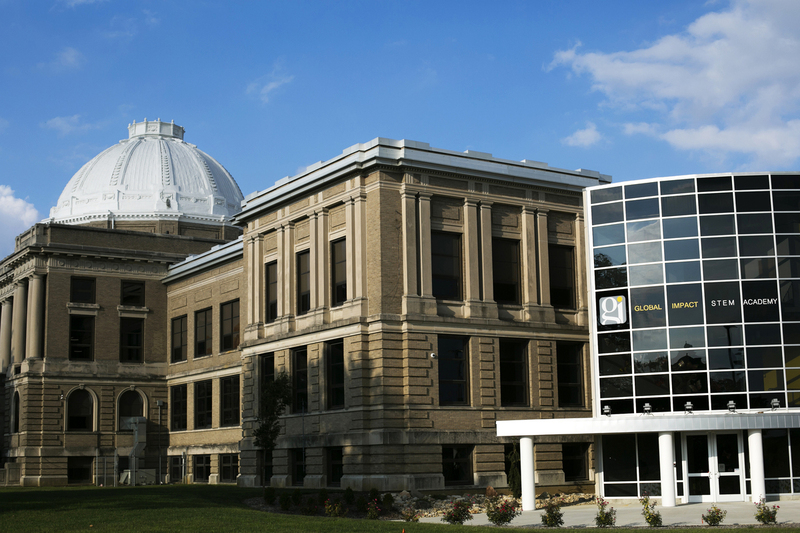 The Global Impact STEM Academy in Springfield, Ohio. The original high school building was modeled after the Library of Congress. Much of the anger and anxiety in the 2016 election are fueled by the sense that economic opportunity is slipping away for many Americans. This week, as part of NPR's collaborative project with member stations, A Nation Engaged, we're asking the question: What can be done to create economic opportunity for more Americans? In Ohio, Columbus has quietly become a model of prosperity, with rising wages and low unemployment. Nearby Springfield, which has seen its manufacturing base erode, is struggling. So what can a city in decline do to make a comeback? 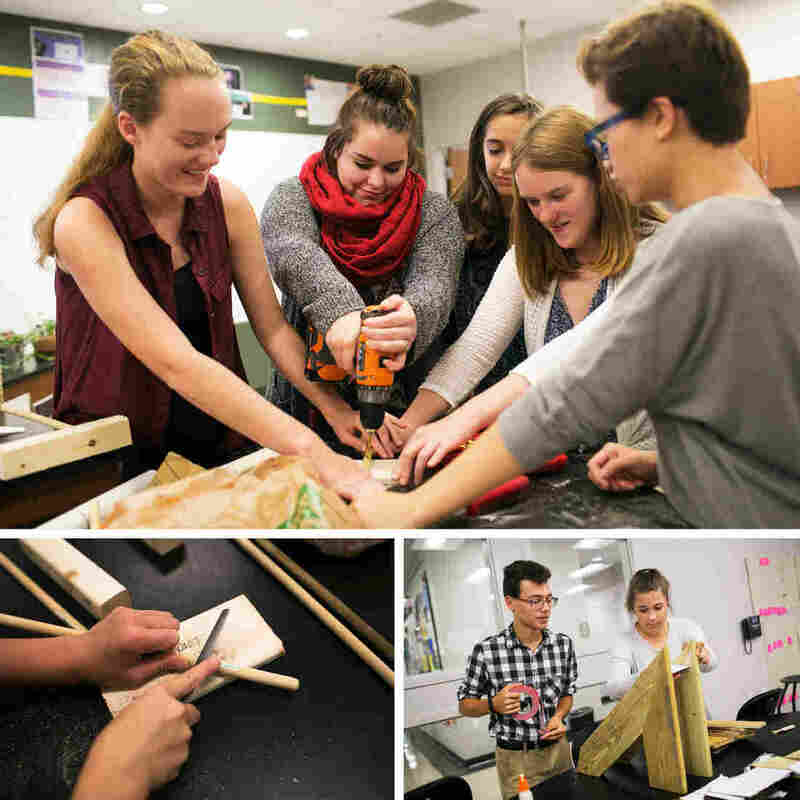 A new high school in Springfield — focusing on science, technology, engineering and math — is trying to turn the tide. But educators and local businesses leaders say success hinges on keeping young people from moving away from the city after they graduate. When you drive into the heart of Springfield, you see a majestic hundred-year-old high school. Modeled after the Library of Congress with a big dome on top, it's a monument to a more prosperous time for the city. 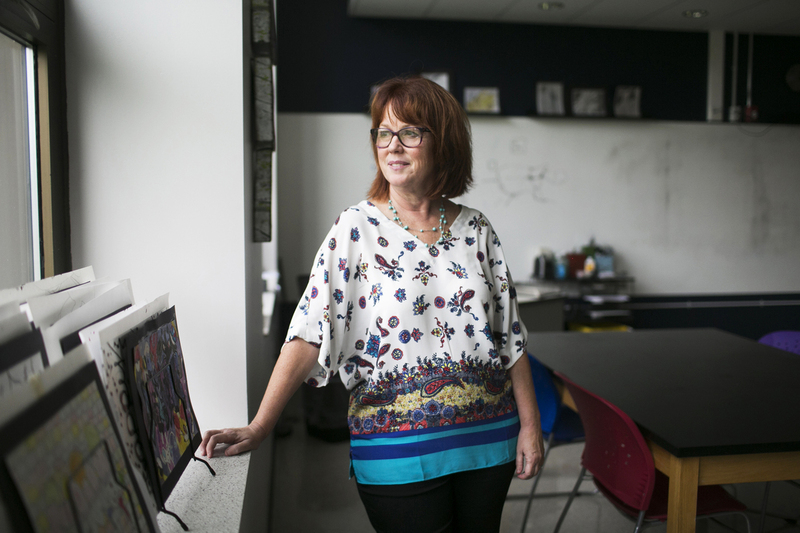 Debbie Kelly, an art teacher at the Global Impact STEM Academy, stands in her classroom. "This is a very exciting, happy place," she says of the revived school. "I think it's just magical." But as nearby factories shut down, household incomes plummeted and people with more resources moved away from downtown and this beautiful old high-school was closed and boarded up. "My mom graduated from here years ago and then other relatives ... you just have a lot of history here," says Debbie Kelly, a public school art teacher in Springfield. "To see it in decline and not used and boarded up. ... You drive by it and it sort of becomes a metaphor for the town. ... Is this where we are? Everything's just dying, nothing good is happening, there's nothing new," she says. (Top) A group of girls works on a project in physical science class at the Global Impact STEM Academy in Springfield. (Left) Hayley Milliron wants to go into engineering or animal science after high school. (Right) Joey Durham and Jada Keplinger, both sophomores, build a gravity xylophone in advanced physical science class. But a few years ago, local officials proposed re-opening this school — to put in a new STEM academy. This could create a higher-skilled workforce for local companies and it might attract new businesses. Some people who live outside the downtown said the area is blighted, that parents wouldn't send their kids there and suggested building it somewhere else. But the naysayers lost. Today the boards are off the windows and there's a bustling new high school here, drawing students from Springfield and surrounding communities. 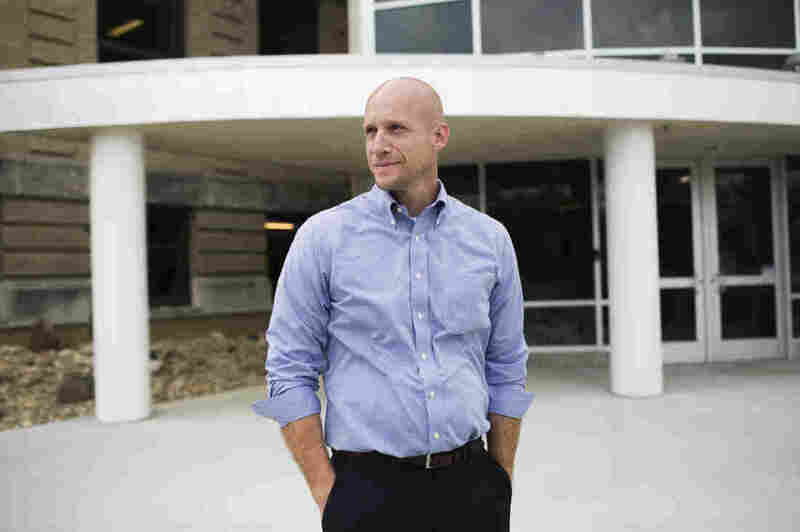 The school is called the Global Impact STEM Academy, and Founding Director Joshua Jennings says it's drawing so many kids he's expanding it, but he also has to turn students away. "We've seen our school grow exponentially and the demand for it here locally has grown incredibly as well," he says. Joshua Jennings, founding director at the Global Impact STEM Academy, stands outside of the school. "We've seen our school grow exponentially and the demand for it here locally has grown incredibly as well," he says. As you walk into the redesigned modern glass entryway, the wall is painted with the faces of famous people. When you touch the faces, you hear quotes read by students. Touch Albert Einstein's tongue and you hear: "You can't use the same thinking to solve a problem that was created by that thinking." At its heart, that's what this school is trying to do: Kids don't just trudge off to math or science class when the bell rings. Actually, there are no bells. Instead, it's more of a workplace environment, from the way the kids dress — business casual — to the colorful and comfortable office furniture instead of traditional school desks, to the kinds of projects the students do. As the school expands — it's up to about 400 students and growing — it needs a new parking lot. So, in math class, that's the project for the week: building a parking lot, figuring out how to fit more cars and leave enough green space. (Left) Mustafa Haleem, a junior at the Global Impact STEM Academy, likes the environment and classroom style the school offers, as well as the use of technology. (Right) Addison Keener, a freshman at Global Impact, works on homework. Student Addison Keener says she was "kinda miserable" and "super-stressed" at her previous school. "Here, I don't even feel like I'm coming to school every day. I'm feel like I'm coming to see my friends and have fun and learn some stuff," she says. Being high school students, they say they want to do all kinds of things — agriculture, medicine, the Marine Corps, psychology, cosmetic chemistry. A Nation Engaged: Is This Still A Land Of Economic Opportunity? But there is a major question hanging in the air: Even if the academy succeeds in motivating kids and teaching them great job skills, will they settle down in Springfield after college? Or will they run off to MIT and stay there, or some other coastal city, or just to nearby Columbus, which has higher-paying jobs on average and a more vibrant downtown. At nearby Clark State Community College, students at the STEM school come to take free college classes, for which they get college credit. College President Jo Blondin says that, of course, not all students will stay in Springfield after high school or college. But a major mission of the school is to get a good number to stay. Jo Blondin, president of Clark State Community College, stands in front of precision agriculture machinery in one of the labs on campus in Springfield. She says getting students to stay in the area after graduation is critical to rebuilding the local economy. "It is critical, particularly in agriculture and manufacturing, we have frankly a landslide of retirements coming in the next five years and we are very concerned that the economy doesn't continue to shrink and that it actually goes in the very positive direction we need it to," Blondin says. So, at the STEM school there's a lot of focus on agriculture. Students study plant and animal biotech, food science and chemistry, and environmental sustainability. 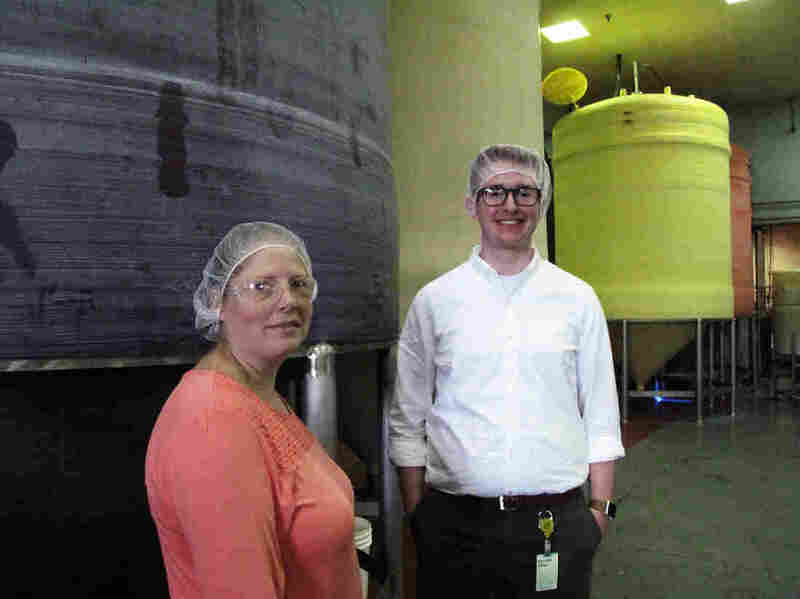 Students do internships at local businesses, so they see firsthand some of the job opportunities in the area and make connections. Student Wesley Sizemore, a senior, interned at a local mustard and mayonnaise factory where he did a school internship. At Woeber Mustard, computers run about a half-dozen different assembly lines where machines whisk glass bottles around, washing them, filling them with sandwich spreads and screwing bottle tops on at super high speed. "When I first got here I had no idea what I was going to be getting into. I mean, I knew I was going to be doing food safety work," Sizemore says during a recent visit to the factory. "I had no clue how intricate the process is just to make mustard and sauces and stuff. It just ... blew me away." Wesley Sizemore, a senior at Global Impact STEM Academy, interned at Woeber Mustard, a local mustard and mayonnaise factory. Woeber Mustard supplies grocery stores and restaurants across the country with all kinds of condiments. Chris Woeber is the fourth generation to run the family business, which has about 200 workers and is hiring more. "We were excited about the school," he says. "From our perspective as a business, this is gonna be training young people with skills that we need. But also as a community member it's been very exciting." Back at the high school — Debbie Kelly, the art teacher, says she's happy to see this old classic building in the center of town full of life again. "To take this and revive it — I think now when you drive by, this is a very exciting, happy place," she says. "I think it's just magical." And reviving the school may prove to be a good omen for Springfield. Household income plunged 27 percent here between 1999 and 2014 — the biggest drop of any metro area in the nation, according to the Pew Research Center. But the latest census data shows that incomes rose at least a bit last year. Students leave school at the end of the day at the Global Impact STEM Academy. Local officials say they're excited that some new employers are moving to the area and, together with local companies, they're announcing hundreds of new jobs. EF Hutton recently announced plans to bring several hundred jobs to a building downtown. Mike Catherwood stands in a cavernous hangar on the edge of a cornfield in Springfield. He's surrounded by five or six Lear jets on jacks in various states of disassembly. 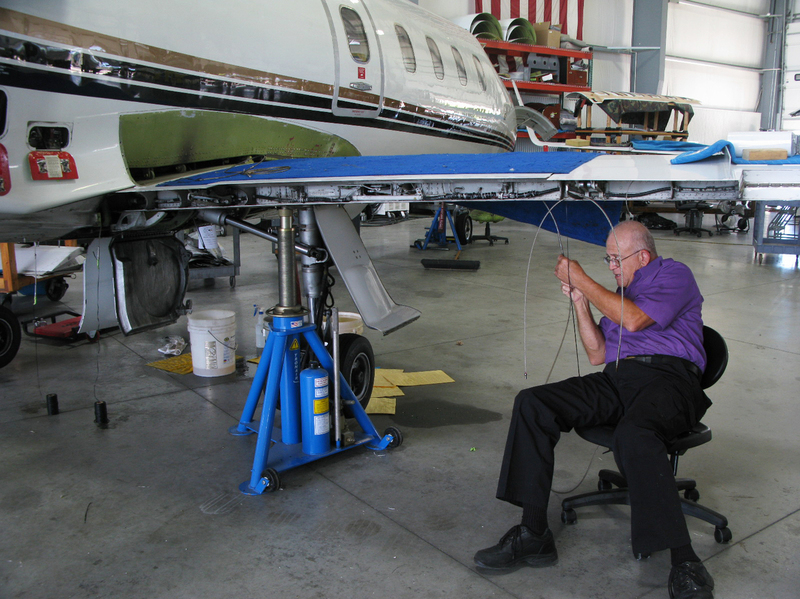 Nearly two decades ago, the retired Air Force mechanic and his partner decided to go into business for themselves, retrofitting small planes. "I was just an airplane mechanic. I met a couple of guys that ... had the same mindset that I had, that we could do this and do it ourselves and make some money and have some fun at the same time and we decided to do that. And the rest is history," Catherwood says. Now his company, Spectra Jet, has so much work it's having to build a bigger hangar. There was a time when Springfield was dominated by one company — International Harvester, which employed 10,000 people at its peak. Mike Catherwood works on a Lear jet in a hangar in Springfield. The retired Air Force mechanic says his company, Spectra Jet, has so much work it needs more space. Today there are still manufacturers in Springfield, but because of automation they tend to employ a lot fewer people. Spectra Jet has just 21 employees. "The numbers are going to be different," says Tom Franzen, the assistant city manager. "That manufacturing plant that maybe needed 2,000 people to turn out that product may only need 500 today. The footprint — the number of people required to do that same work — is just less today." The loss of so many jobs has caused Springfield's population to drop from more than 80,000 in the 1970s to fewer than 60,000 today and median income has fallen sharply in recent decades, though it ticked up last year. City officials are working hard to lure new businesses, with some success. But like a lot of aging Rust Belt towns in the Midwest, Springfield faces enormous challenges. Lori Minnich, head of the city's small business development center, says it can be hard for local businesses to raise the capital they need. "The disadvantage and the challenge is we really don't have venture capitalists, so we don't have a large pool of individuals that want to invest in small businesses," she says. Minnich says local foundations fund some small businesses and the businesses can sometimes qualify for government-backed loans. But the big money goes to places such as Columbus, almost an hour away. That makes it a lot harder to attract the kinds of businesses that will keep young people around. Emily Taylor, a student at Wittenberg University in Springfield, wants to stay in the city, but she hopes to be a forensic psychologist and there aren't a lot of jobs in her field. "Here it's kind of harder. There are like a couple of open positions, there's like two or three. ... Dayton is a lot bigger. Because it's a bigger city they have more job opportunities," she says. The lack of opportunity for young people is a problem that worries people such as Ed Leventhal, who's lived and worked in Springfield for 40 years. His small metal fabricating company employs about 50 people, but he has trouble finding enough skilled workers who can also pass drug tests. At the same time, he has watched many people leave Springfield. Executives who run local companies choose to live in the exurbs of Columbus half an hour away. 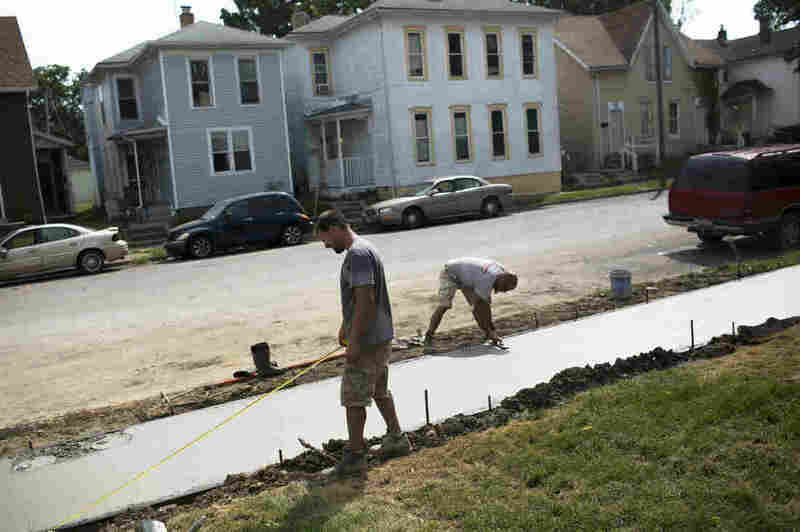 People work on restoring a sidewalk in Springfield. The loss of so many jobs has caused the city's population to drop from more than 80,000 in the 1970s to fewer than 60,000 today. "In the old days we had a lot of family businesses and the people who owned the family businesses lived here, raised their family here, sent their kids here," Leventhal says. "And those family businesses have over the years died off, closed and some of those family members, there's no one left in Springfield." A few years ago Leventhal started a second company that does metal finishing for manufacturers. He did so partly because he wanted to provide his son a job so he could stay in the area. Leventhal's two grown daughters now work on the East Coast. "It's a problem for the economy because young people give vitality to a community. If you don't have young people, then I think you're in a downward spiral," he says. Springfield probably isn't in a downward spiral yet. There are jobs to be had — especially in light manufacturing and health care. But if the city is ever going to thrive again, it needs a lot more than that. It has to generate the kinds of well-paying jobs that will keep its best and brightest from leaving, and that's a much bigger challenge.